Blessing Ali released her 3rd single alongside the visual titled “Ese Oluwa” (Thank you Lord) recorded live at Futura productions studios. 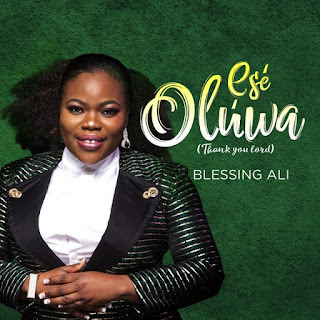 Ese Oluwa is a worship sound that is released to all nations of the world, people from different tribe and cultures will get intimate and wrapped in God’s presence as they sing this song of healing, deliverance, breakthrough and Love song to the God of all creation. The single is available on iTunes and all media platforms. Blessing Ali is a Seasoned Praise/Worship leader of our time, A Singer/Songwriter and also a Recording Artiste, her high pitch range and melodious tone ushers any audience into the presence of God through cooperate Worship while her energetic stage presence sweeps any crowd off their feet into High praise and Dance to the Lord. Her image portrays Anointing, Energy, Freedom and Liberty. Her musical style is a fusion of Urban Contemporary Gospel, Afro-Caribbean Gospel, Inspirational and Gospel R&B. She is passionate about Kingdom Music, Her constant aim is to minister unto God and serve the People pointing their focus to the saving power of Jesus through Music and the Word. Born in Lagos Nigeria, Her musical journey began at a young age coming from a family that loves music, she was introduced to using her gifts and Voice for service to the Lord by her mother and praying grand-mother, she has been on the music stage for over Ten years serving in various Church choirs, musical groups and band where she was mostly the lead vocalist. Upon relocating to the United States, She eventually branched out to become a solo gospel artiste a few years back. Her Voice and dynamic style of music appeal to people of all works of life ranging from Children, Youth, and Adults of diverse ethnicity. An award-winning Artist, Blessing Ali recently won the African Gospel Music Awards 2017 (AGMMA) from the United Kingdom as the Artist of Excellence recognized in the United States and Canada. She is positively influenced by Bishop T.d Jakes, Yolanda Adams, Pastor Donnie Mcclurkin, Minister Pat Uwaje King (Midnight crew), Rev Benjamin Dube, Pst Stephen Aryitey, Pastor Amos Emovon (Rccg), Pst Henry Nwosu, Apostle Chioma Jesus, Rev. Dr. Sylvia Blessings and many more. She has been blessed and humbled to share the stage with music ministers such as Tye Tribett, William Mcdowell, Yaw osei-Owusu, Jumbo Ane, Jason Nelson, Nathaniel Bassey, J.J Hairston and many more.